Watch: Puget Sound scientists rescued this whale. Now they need your help finding it. Three days. One yacht owner. Many marine biologists. 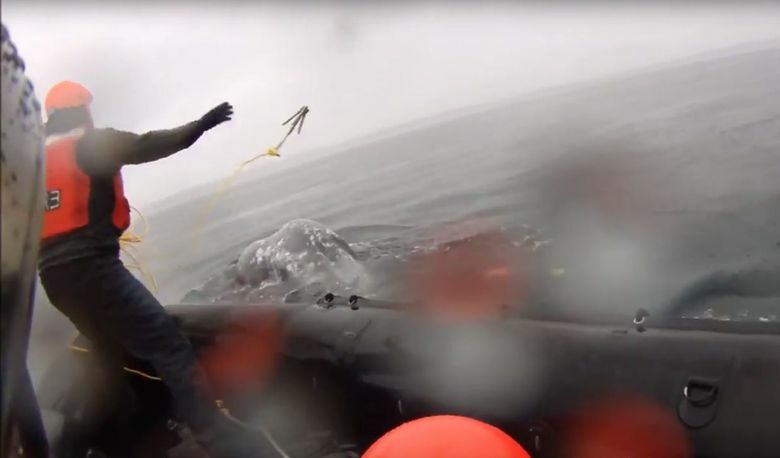 This is how scientists untangled a gray whale from fishing gear last weekend — and then lost it "in an unusual turn of events." Tangled in fishing equipment, the gray whale causing a massive search campaign this week first caught the attention of a ferry captain heading north from Mukilteo to Clinton in Puget Sound on Friday. Next, it garnered the attention of marine biologists from agencies around the region. They launched a dayslong search-and-rescue effort to free the mammal from the fishing gear. The pursuit included an airplane, bad weather and a technological mishap in which a tracking device on the whale dislodged. Now, scientists say, the whale’s next spotter could be you. The fish-ecology division of the National Oceanic and Atmospheric Administration (NOAA) is asking for the help of boaters or whale watchers to find the gray whale, whose gender and age are unknown, so scientists can check its health and if any fishing line or floats remain stuck, according to a news release from the agency. Scientists at this point do not believe the whale is a member of pods that regularly feast in the Pacific Northwest this time of year, meaning they do not have prior information on its patterns. They described it as thin. Soon after the report from the ferry captain, who was making the trip in Washington State Ferries’ 1,200-passenger M/V Kittitas, scientists assessed Friday’s weather to see if they could make a voyage out to sea and untangle the whale safely. They determined the wind was too strong and made plans for the next morning. After hours of searching in heavy rain and fog, scientists found the whale Saturday evening. They attached a satellite-tracking device, a buoy, to the marine mammal and took photographs underwater to determine how the fishing gear — possibly a crab trap — was tangled around its body. The sun went down, so the team suspended the rescue effort, thinking the tracking device would allow them to keep tabs on the whale and pick up where they left off Sunday morning. But the marine world offered a different fate. “In an unusual turn of events, the tracking signals stopped overnight, suggesting the tracking buoy was being held underwater,” the release says. The team searched where it saw the whale Saturday. One of the many agencies, Cascadia Research Collective, even scoured the sea from an airplane. Then, around noon Sunday, scientists picked up signals from the tracking technology, showing the buoy on land near Port Hadlock-Irondale in Jefferson County, “presenting a further confusing situation,” the release says. The rural area borders a bay, Port Townsend Bay, which is an inlet of the Admiralty Inlet between Puget Sound and Strait of Juan de Fuca. Later Sunday, an owner of a yacht reported seeing the whale swim under his boat near Port Hadlock-Irondale. The development was a bad-news, good-news situation. Scientists believe the whale rubbed against the yacht’s rudder, “which unfortunately pulled loose the telemetry buoy, and thankfully cut the entangling line and removed one of the floats from the fishing gear,” the release says. That means the whale is out there somewhere, perhaps for you to find, apparently carrying some remaining fishing line and gear. The positioning of the equipment is not life-threatening and it “commonly comes off over time,” the release says. Only qualified marine biologists under NOAA’s standards should respond to entangled whales. For regional shore-based whale-watching posts, the nonprofit Orca Network has created an online guide with 100 viewing sites. Anyone with information on the missing gray whale can call 1-877-SOS-WHALE (1-877-767-9425) or hail the Coast Guard on Channel 16. “Although whales are large, it can end up feeling like looking for a very large needle in a very large haystack — our oceans,” the release says.